The microgrid at the Marine Corps Air Station Miramar, Calif.
Microgrids act as insurance if the central electric grid fails. So it’s fair to ask, how do you keep the microgrid from failing too? It’s a legitimate worry since microgrids increasingly provide back-up power for critical facilities — hospitals, emergency services, telecommunications towers and the like. This is an issue IPERC (short for Intelligent Power & Energy Research Corporation) has been grappling with for years. The military is one of the New York company’s main customers. So it has heavily focused on microgrid reliability and cybersecurity. IPERC designs mobile military microgrids to withstand harsh and hostile environments. 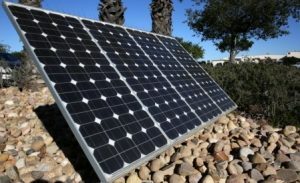 From all of this work, the company has come up with kind of back-up to the back-up, resiliency within the already resilient microgrid to serve not only the military, but also utilities, communities, campuses and others connected to the central grid. Called Distributed Cyber-Secure Architecture, the system mimics within a microgrid the same philosophy that underlies distributed energy. Security lies in redundancy created by several self-sufficient operators that work together — rather than one central controller that may crash the whole system if it fails. In this case, distributed computers interact together to control various aspects of the microgrid, such as generators, buildings, and distribution systems. The palm-size computers all constantly talk and respond to each other. IPERC has been working on the distributed architecture for a decade and offers it as part of its GridMaster microgrid control system. Each small computer has an assignment. For example, a unit may be dedicated to a particular generator within the microgrid. But the computer also can job share; it can step in and take over another task depending on what’s best for the microgrid at any given time. For example, if a computer fails in serving as the master controller, another becomes master. The controllers operate under general algorithms that allow for a flexible and changing microgrid. 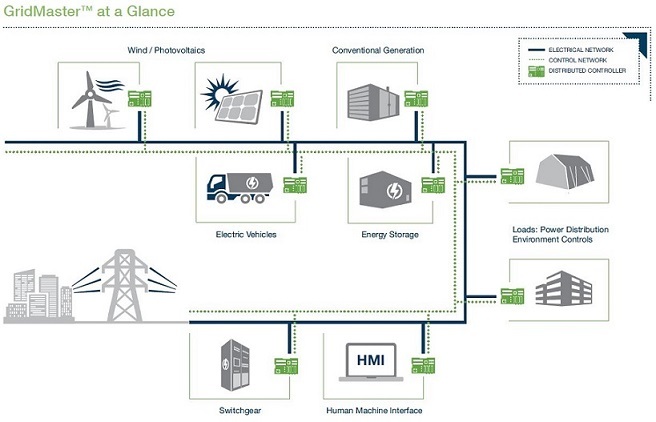 New generation can be added or operations modified, and the microgrid will reconfigure without human intervention. The nodes work together to sort out priorities within the microgrid, which is especially important during periods of load shedding. “Some computers might be associated with loads that are not as important as other loads. If necessary, those loads would have to be sacrificed in order to make sure the absolute critical loads stay energized,” he said. For example, in a hospital the lights in an operating room are crucial; energy to the coffee maker is not so important. So the controllers decide what stays on and what can be turned off temporarily. “Decisions are made based on the observed characteristics of all of these different kinds of equipment,” he said. IPERC is accustomed to dealing with a client that is highly sensitive to cybersecurity issues, the military. Now the utility industry is becoming increasingly alert to the problem, too, after several serious attempts to hack U.S. energy infrastructure. With this heightened concern about the electric grid’s security, the question becomes, “Why invest all of this money into infrastructure upgrades, yet leave it vulnerable to a 17 year old with a computer,” said John Carroll, IPERC’s business development director. Why invest all of this money into infrastructure upgrades, yet leave [the grid] vulnerable to a 17 year old with a computer? The distributed nature of the IPERC system helps ensure cybersecurity in what is already a heavily encrypted system. “The distributed architecture inherently lends itself to security and resiliency,” said Aura Lee Keating, IPERC’s cybersecurity/IA manager. This super resiliency negates the need for a third-party ad hoc security system that wasn’t necessarily tailored for the microgrid, she said. The microgrid is designed under the assumption that firewalls can be breached. Adding distributed architecture does not add any significant costs to the microgrid, according to IPERC, which describes its controller system as priced competitively with others in the market. The small, distributed computers generally cost less than $1,000 each. “We’re not using high powered processors in all of these computers because we don’t have to. By distributing a bunch of fairly small, low-powered computers, it’s almost like the insect colony — each individual insect isn’t powerful on its own but the colony as a whole is powerful,” Curtiss said. The company says it is seeing interest in its system from a range of customers: communities concerned about maintaining power to vital services, embassies, hospitals and others. IPERC recently scored a major win with its key military market with the first-ever Department of Defense accreditation of a microgrid control system. …the industry has been shoe-horning in legacy tech. The accreditation was issued after rigorous security testing of its GridMaster control system at Camp Smith in Hawaii, a capstone project of the three-phase SPIDERS (Smart Power Infrastructure Demonstration for Energy Reliability and Security) program, which IPERC worked on. At Camp Smith, the company led the design of controls, communications, and cybersecurity. The system withstood 19 different security attack tests. “From a competitive perspective the industry has been shoe-horning in legacy tech, and now we are seeing the advent of some next generation systems, patented systems like this one that will revolutionize how utilities and microgrid development occurs,” Carroll said. 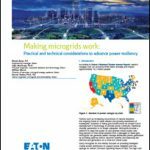 Interested in learning more about microgrids? Subscribe to the free Microgrid Knowledge newsletter.